In our homestead, having a quality whole-house water filter was at the top of our list. Clean water matters so much to overall health…and just filtering our drinking water wasn’t cutting it. This is such a complicated topic, with so many different companies offering options, all claiming that theirs is the best. And every system has different components to it, so there are multiple ways the water is being filtered. What’s truly best? And how are you supposed to know? *Drugs get into the system because people either flush unused prescriptions, or when they consume them and unmetabolized drugs are excreted from their bodies. All of these drugs aren’t completely removed from the water, and we obviously shouldn’t be exposed to these chemicals! +Added on purpose by the water filtration plant in most cases (fluoride can be naturally occurring and about 1/3 of the areas in the US do not add it). ^From farm run off. Phosphates and other farming chemicals may be high in certain communities. If you check google, you can find your city’s water report, to see if they are in compliance with the EPA laws for contaminants. But the EPA doesn’t place limits on prescription drugs and some of these other contaminants, so even if your water is “compliant,” it is still not clean. And that’s a problem! What Do I Want From a Water Filter? The simple answer is, pure, safe water. The detailed answer is a whole lot more complicated. We obviously want to remove the contaminants that shouldn’t be there, like chlorine, pesticides, and herbicides. And, we want to remove dangerous bacteria or viruses that could make us sick. But there’s more to this than that. What is biologically normal water? What kind of water are we supposed to drink? Some systems make a big deal out of being “pure,” and completely free of everything. Other systems make a big deal out of leaving in beneficial minerals, which they say is needed because our soils are so depleted. Still others make a big deal out of the “proper” water pH level…. In nature, water is not pure. It has quite a few trace minerals, like calcium, phosphorus, magnesium, potassium, and others. It also has a normal pH of around 8 or so. This seems to be the water that we were meant to drink. So, that’s our goal: to end up with a water that has a slightly alkaline pH, that retains beneficial minerals, and that is otherwise as “pure” as possible. So, what are we supposed to do? What kind of water filtration should we be using? There are two main “styles” of these filtration systems — RO (reverse osmosis) and carbon-based (like Berkey). But each of these actually uses a variety of filtration parts…and this gets complicated…so hang with me. 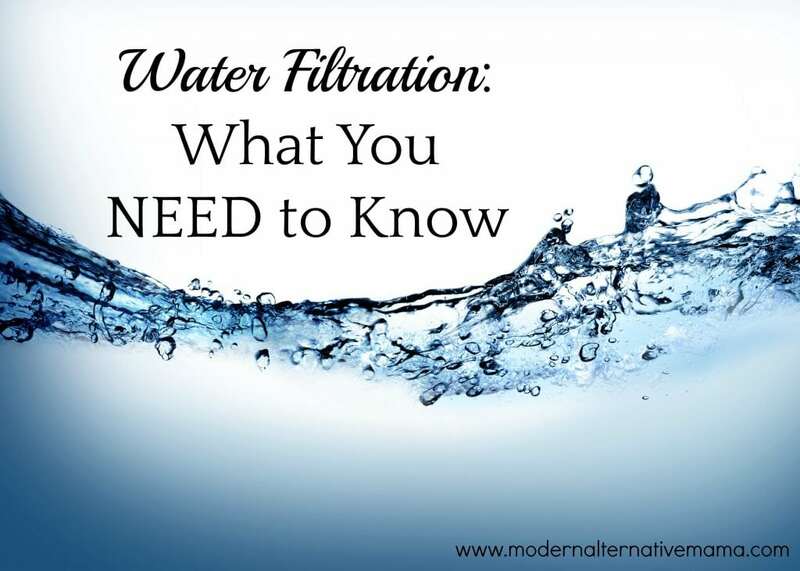 There are three “types” of filtration media. There is the physical filter, which literally just catches any bad stuff because the particles are too big to go through. Then there is the adsorption filter, which attracts certain types of particles and traps them. And there is the chemical filter, which neutralizes things or changes the chemical structure or does a kind of “swap” thing (since certain elements will bind well with either A or B, and one is dangerous and one is not, so we remove the bad one in favor of the good one). Every system uses some version of a pre-filtration set up. It’s essentially some kind of membrane with holes that are 1 micron in size (that’s 1/25,000 of an inch). This catches all types of sediment and junk that shouldn’t be in the water, plus larger bacteria. It’s a start, but it won’t make water truly safe. A lot of the “bad” stuff is much smaller in size than this, or is dissolved in the water and can’t be physically separated. Essentially, this is a chemical reaction between the copper and zinc and other minerals/heavy metals in the water. It helps to remove chlorine, iron (not necessarily beneficial), and may reduce bacteria and viruses somewhat. It isn’t adequate as a filter on its own, but its use can make carbon filters last longer, so it’s often used with it. Activated carbon is a highly porous surface that adsorbs (yes, with a ‘d’) a lot of bacteria, viruses, pesticides, herbicides, and other contaminants, trapping them on its surface and removing them from water. It won’t remove nitrates or fluoride, which is a big deal for many. Well — it will remove some fluoride, but its capacity to do so expires rather quickly, long before its capacity to filter everything else expires. To make this more complicated, carbon can be made in different “levels” and from different materials, and it can be more or less effective, depending on these factors. It’s often paired with an RO filter, to remove the worst of the contaminants before it gets to the end. This is very similar to activated charcoal. Both are produced by burning a material without oxygen presence. But while activated charcoal is some plant material (often wood or coconut shells), bone char comes from the bones of animals, usually beef bones. This is important, because it’s high in calcium, and it chemically reacts with fluoride and essentially removes it from the water. (Turns it to an inert substance.) It also removes arsenic. This is ethically questionable for some, obviously, since there’s the use of animal bones. And, I can’t find clear data on whether or not it removes other metals, like magnesium. No one seems to have studied that, but knowing that most other methods that remove fluoride also remove all beneficial minerals, I’m leery. This is another method that removes fluoride and arsenic, but some believe that aluminum can then leach into the water, and that causes its own problems. (source) This is what the Berkey white filters are made of — aluminum oxide. I can’t find test results on whether or not these remove beneficial minerals, although sources claim they do not. This is a type of filter that uses special light to kill bacteria and viruses. It’s not enough on its own, but it is often the final step in a filtration process. There are no known “issues” with this type of filtration. Then, we get to the RO. This technology was originally created to desalinate sea water (remove the salt) and it’s very effective at this. However, it does not remove all contaminants…especially chlorine, VOCs, and some bacteria and viruses. It’s usually paired with a carbon filter for this reason. It does strip the water of important trace minerals, like calcium, potassium, and magnesium, and it leaves the water with an acidic pH. It’s basically just good for removing salt and fluoride. One study shows that when RO water is used for cooking, it leaches minerals from food significantly. This “soft” water consumption has been associated with increased risks of pregnancy complications, cancer, and death. Another study showed an association between RO water and B-12 deficiency…which too many of us lack already! Yet another study called the water “biologically unstable” and showed that it is a potential breeding ground for bacteria…which is kind of the opposite of what we’re going for. The water is also tough on pipes, and can leach minerals from them…which may be minerals you don’t want in your water. Many pipes have iron, some old ones still have lead…. At any rate, this is not ideal. RO water also wastes a lot of water because the system requires flushing and can’t all be properly filtered. As a side note, we’ve had RO water in bottles for awhile and I always feel so much thirstier when I drink it…it feels wrong…which is what started me researching why that might be. It’s likely because it is leaching minerals from the body…creating a deficiency of electrolytes and vitamins…and harming health over time. What About Remineralizing the Water? I looked into this option, although to be fair, I was already against it. I had tried two of the top clean, pure organic minerals supplements in the past, and had both had given me bad headaches. But I wanted to understand why. Even if there were a truly safe, contaminant-free mineral supplement to add back to the water, it would depend what form the minerals were in, how much was in it, etc. And, it’s yet another step to create drinkable water, and one that’s unnecessary if you don’t strip it all out in the first place (for very little benefit). We can eliminate RO filters immediately, because the water has serious drawbacks and, in my opinion, not a lot of benefits. It’s also more expensive. Frankly, I consider it dangerous for many, and I would never have one in my home. A combination of a quality carbon filter made from coconut shells, with copper-zinc mineral stone, and a UV filter seems to be optimal. If fluoride is a huge concern for you (and it won’t be if you are on well water or one of the 1/3 of people whose cities do not fluoridate), then you could add a bone char filter too. Although I’d like to see more research on the bone char option, personally. I have not decided yet on which company we will go with, but now I know what I’m looking for and what questions to ask. Once we decide on a system, I’ll get back to you all and let you know what’s out there! Does water filtration concern you? What system do you use? I would like to know which filtering system you use now. Thanks. I would love to know as well! Looked into a Berkey but we don’t have extra counter space for it right now. I’d love to know which system you bought as well! Could you please share? Thanks! I bought a Pure Effect under counter system a few years ago. It was the best one I could find. It was expensive so I researched it for a while before I bought it. Have you looked into this one at all? I just looked at it — looks like a very good system! Could you email me and let me know which filter you went with, I am looking for a new option for our home. Thank you! What a nice information to know about Water! Thank you so much for this article. You did a great job! Thank you so much for your hard work in researching and writing this article. It is excellent. It’s very difficult to find trustworthy information about water purification. Thank you for covering all the different filtering systems in detail. I’m waiting for your final decision cause l need to change my Aquaovo counter water filter very soon. WWYD?! We just moved to a different state where the water in the country is delivered via a rural water district that uses RO before it comes to us. Chlorine is added after the RO so we got a Berkey to filter the water here at home. I was just going to add in some Concentrace drops until I read your views on those. Any ideas of what we should do to get minerals back in the water? Thanks!